Once among the pioneers of early death metal from Florida in the mid 1980's, Obituary has had a millennial renaissance over the last five years. In parts, Darkest Day is true to Obituary's classic form. However, if anything is different, then this is an uneven offering of various heavy metal styles which makes for a very confusing presentation. 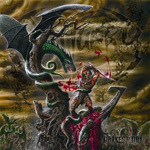 First, Darkest Day is eclectic in metal styles. The first two tracks List Of Dead and Blood To Give, the finest songs on the album, are a perfect blend of traditional thrash, death metal, and a solid dose of melodic heavy metal. Both are filled with memorable tempo changes, amazing guitar solos, the most amazing drumming from Donald Tardy, and brother John almost sounds human. From here it's mostly down hill with sluggish doom laden metal, without the complexity often found in very good death metal, from Lost through title track Your Darkest Day. This is followed to the end with basic thrash meets death metal pieces of more even tempo, but never quite as memorable as the beginning tracks. Exceptions come in the form of blistering traditional thrash, possibly nearing modern metalcore, on Violent Dreams; but the album closes with the horribly long and exceedingly boorish, Left To Die. For pure American death metal, you must listen carefully because it really only shows up in Your Darkest Day, maybe on This Life, and possibly Left To Die (but as mentioned, its more doom/death then pure death metal). Obituary lives and breathes solid old school heavy metal with their ventures into thrash, death and doom. Additionaly they have some of the best metal drumming and fret work anywhere this side of death metal. Conversely, the worst of death metal is also found here in the exceedingly oppressive and monotonous growling vocals (fortunately, John Tardy can show some variation at times); but without it, I guess it couldn't be death metal. On Darkest Day, American death metal pioneers Obituary are in transition, experimentation, or simple confusion because this is an eclectic disc of heavy metal styles. There's more boggish doom metal and nominal bits of thrash metal than traditional death metal here. I'm not sure where they're going.